Holly Shaw: Have You Seen It? Had to take a moment to mention (okay, confess) my new obsession. Friday Night Lights. Yes, I know, the season is over. If you are like me there are only so many shows you can fit in during the regular season. Sad but true, I know. Well, I missed out on this little joy and now it's in reruns. Yep, I'm a bit late to the party...but at least I made it! Y'all, this little TV show is good! It's not just football girls, really (I mean unless that's your main thing). It's rich with drama y'all. We're talking about a show layered with high school drama, family drama, life changing issues, teenage angst, humor, and of course...football. Set your DVR for Sunday nights at 8 p.m. and check this out. It's just good TV folks. Seriously. ok..I'm gonna try it...you talked me into it! if only i had cable...wait..is it dish now? are they the same thing?! 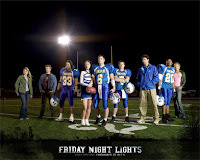 Have you read the book "Friday Night Lights"? Very entertaining.